I woke up this morning and saw my calendar, and had a great realization. Baseball starts in two days! Though it’s still cold, we can all take solace in the fact that the boys of summer are ready to go. The Pirates won’t get to start until Friday, however, they finalized their 25-man roster before their last second two game tune-up in Philadelphia that starts tonight. There were a few surprises, including the team’s choice to keep Rule-5 selection Josh Rodriguez to be the backup utility infielder over Pedro Ciriaco who had a great spring. They also kept Michael Crotta to round out the bullpen with the pitching becoming somewhat endangered with last minute injuries. Here is what the roster will most likely look like. It’s also worth noting that Chris Snyder’s DL trip freed up a spot on the roster for John Bowker. This also means Ryan Doumit will be the starting catcher (deep breaths people). 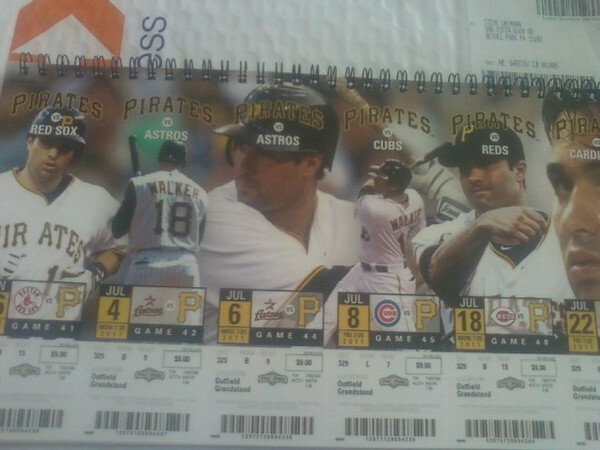 It always seems like the littlest things get me so excited for baseball season, case in point, my ticket book arrived the other day. 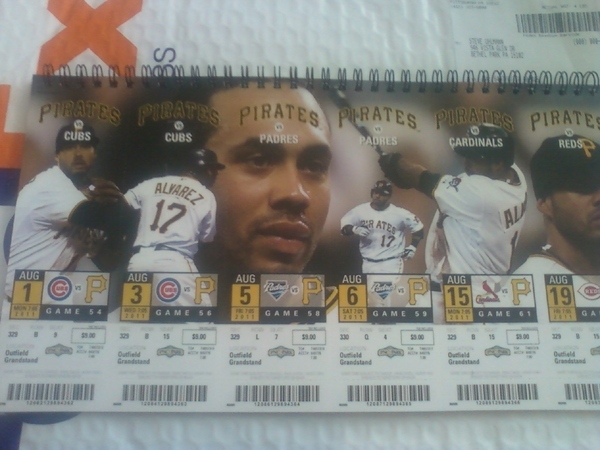 The tickets when put together make nice murals of Andrew McCutchen, Neil Walker, Pedro Alvarez, and Jose Tabata in action. So nice that it pains me to use them. Keep it here, as tomorrow morning I’ll have all the links from both the Pirates-Phillies tune-up tonight, and the Penguins pivotal matchup with the Philadelphia Flyers for first place in the Eastern Conference (lest we forget). Also if the weather holds up tomorrow night, I’ll be at the Ohio-Cleveland State baseball game Wednesday night. I hope to have plenty of pics from it on here afterwards.